The two principal advantages for a hosted payload owner of flying on a commercial mission versus a government-sponsored mission are: (1) the faster tempo of commercial programs, and (2) the lower cost. Typical schedules for commercial satellite deployments from concept definition to operations are around 32 months. Comparable government schedules can be five to seven years, and sometimes longer if the primary government mission is complex. And while many science missions have been limited to low earth orbit (LEO), given the expense of getting to geostationary orbit (GEO), the use of hosted payloads on commercial GEO satellites provides a relatively low cost opportunity for access to higher orbit. Other advantages include: a reliable and predictable launch schedule, with a large choice of launch vehicles (commercial operators usually are on the manifest of several launchers, in order to be better prepared for contingencies); the use of existing mission support facilities; and the fact that, once on-orbit, the primary payload operator will take care of all operations and maintenance of the host spacecraft as well as (if requested) data downlink and processing. In addition, since commercial spacecraft are insured, the hosted payloads on those spacecraft can also be insured, helping defray the costs of a replacement mission in the event of a launch failure. Disadvantages include the inevitable limitations on mass, volume, and power consumption that the status of secondary payload often entails (while some hosted payloads may effectively hold primary status, this is not typically the case). In addition, there is the requirement to adhere to the strict procurement, construction, and launch schedules for commercial satellites, which are typically much less flexible and more driven by time constraints than their government counterparts. Another disadvantage, often overlooked but important for Earth observation missions, in particular, is that although the number of commercial geostationary spacecraft launched in a particular year is quite large, each of them will occupy a fixed orbital slot with limited views of the Earth. This allows for multiple observations a day, but not a global view. The amount the hosted payload owner would have to pay to the primary payload operator is difficult to assess, and is likely to vary considerably. Key variables include the size and mass of the payload, what ancillary services are desired to support payload operation, whether payment is up-front or over the satellite lifetime, opportunity cost to the host, whether it enhances the host systems business case, choice of launch vehicle, insured or not insured, and so on. A further area to be considered is the fact that the primary commercial payloads typically have a lifetime of 15 years and often more. Many hosted payloads, by contrast, have a projected life of five years or less. This mismatch is less of an issue for communications payloads, which may be designed to operate for as long as the primary spacecraft. On the other hand, this long host platform life may present an opportunity for enhanced data continuity that has not typically been available to past payload missions. 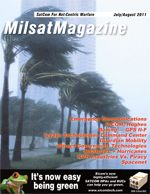 All of the major commercial GEO fixed satellite operators (Eutelsat, Intelsat, SES, and Telesat) have publicly declared themselves receptive to the idea of hosting payloads, as have non-GEO users such as Iridium and ORBCOMM, and a number of these operators have hosted government payloads. Outside of the global operators, INSAT has hosted several ISRO payloads, all of them either scientific or technology demonstrators in nature. Among the first major U.S. government payloads hosted on commercial GEO satellites were the two L-band Wide Area Augmentation System (WAAS) Packages operated by subcontractors Telesat and Intelsat for the prime, Lockheed Martin, under contract to the FAA. One WAAS payload is carried on Telesats Anik F1R, built by Astrium and launched in September 2005. The other WAAS payload is on Intelsats Galaxy 15, a satellite Telesats Anik F1R, built by Astrium and launched in September 2005. The other WAAS payload is on Intelsats Galaxy 15, a satellite built by Orbital Sciences and launched in October 2005 (the satellite was part of the PanAmSat fleet when launched). More recently, two demonstration payloads were completed. The first of these is the Internet Router in Space (IRIS) hosted on Intelsats Space Systems/Loral-built Intelsat 14 satellite, launched in November 2009; the second is the Commercially Hosted Infrared Payload (CHIRP) sensor which will be integrated on the SES WORLDSKIES SES-2 satellite under construction by Orbital Sciences for launch in late 2011. Also in the construction stage is an operational UHF package which the Australian Defence Force (ADF) contracted for launch on Intelsat 22, a Boeing-built 702B bus, in mid-2012. Most recently, the DoD has contracted for a UHF payload to be hosted on the Intelsat-27 spacecraft, to provide capability to complement the existing UHF Follow-On (UFO) and future Multi-User Objective System (MUOS) satellites. While each of these programs has provided insights that are incorporated in this guidebook, the primary lesson, noted in interviews and workshops among operators and manufacturers, is the need for adequate planning and realistic expectations on the part of the hosted payload owner. The earlier the hosted payloads requirements are incorporated in the planning process for satellite procurement, the greater the likelihood that they will be accommodated. To provide some context for understanding the potential opportunities for putting a hosted payload on a commercial GEO satellite, Table 1 at the bottom of this page lists known planned satellites by Eutelsat, Intelsat, SES, and Telesat for the period 20112016, including their launch year and their planned orbital locations. Although all of the major operators have indicated they would be willing to host payloads, practical constraints indicate that the larger the bus and the longer the lead time, the better the chances are that the hosted payloads requirements will be accommodated. Those satellites marked HR are hypothetical replacements anticipated to be ordered to replace existing spacecraft, but have not been contracted. In addition to these spacecraft, Iridium is now building a new LEO constellation, and had stated its interest in hosting payloads on some or all of these spacecraft, planned for a series of eight launches between the first quarter of 2015 and the first quarter of 2017.